How Does a Chipmunk Camouflage Itself? When you aren’t very big or imposing and look a lot like a meal to the likes of foxes, owls and other predators, being a wallflower is a real advantage. In the case of the diminutive chipmunk (Tamais spp. ), looking a bit like the leaves and branches of the trees and ground where he lives is an effective way for him to stay off the menu -- particularly during the autumn nut gathering season when he may be more exposed than usual. The chipmunk is a member of the squirrel family and includes some 25 species of the genus Tamais, of which all but one member resides in North America. Of those species, none is more often associated with the name “chipmunk” than Tamais striatus, the Eastern chipmunk. This little fellow of 5 to 6 inches in length and only 2 to 4 ounces in weight conjures cartoon images with his chubby body and bulging cheek pouches, but he is a very real animal for all that. And being real, his escape plans are more likely to include natural camouflage than hopping into a toy getaway car. With five brown-black lines running down his back, interspersed with lighter tan markings plus two more dark stripes around his eyes, the chipmunk blends easily with dead leaves and soil on the ground where he spends most of his time foraging. Chipmunks prefer mature, open woodlands where the dappled sunlight and the play of light and dark upon the forest floor further aid their disguise. Even when in trees, the combination of shape-disrupting stripes and sunlight against the black and brown patterns of tree bark and limbs keeps them well-camouflaged from enemies. Discretion is a big part of the chipmunk’s camouflage. When danger presents itself, he often scurries quickly to his burrow beneath a log, a convenient rock pile or at the base of a tree. From the safety of his shadowy doorway, he can keep a sharp lookout for predators like hawks, bobcats, raccoons, dogs and cats. Even though primarily solitary animals, chipmunks often vocalize their fears with specific alarm calls to nearby relatives, causing the entire clan to take up guard duty. Sharing the vigil creates a kind of psychological camouflage that minimizes risk to the individual by distributing the responsibility for watching to more members. In temperate climates, like North America, there comes the inevitable time when handy twigs, leaves and soil chipmunks depend upon for disguise give way to heaps of cold white stuff. Since Nature did not see fit to equip them with a change of clothing to match the winter environment, it is probably a good thing that chipmunks doze away those months when coming out might expose their tiny brown bodies against revealing snowdrifts. Snug in extensive burrows 10 to 30 feet deep, and with a cache of food nearby for a midnight snack, chipmunks stay cozy until spring, when returning foliage makes the forest floor a safe place once more. Of course, semi-hibernation is not true camouflage, but being out of sight of predators goes a long way toward staying alive. Do Squirrels Pack Nuts in Their Mouths? What Does the Gray Squirrel Use Its Claws For? 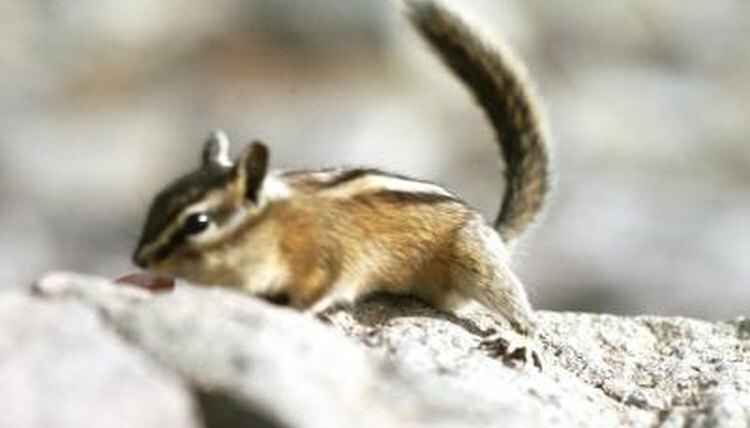 Why Do Chipmunks Have Stripes on Their Backs? What Type of Shelter Does a Morpho Butterfly Need?